The Hospital Art Project > No.6 "Listen Carefully in the Garden"
"Listen Carefully in the Garden"
Setting up atelier in the hospital. Lecture – "Life's Art: Hospital Art" or general public. 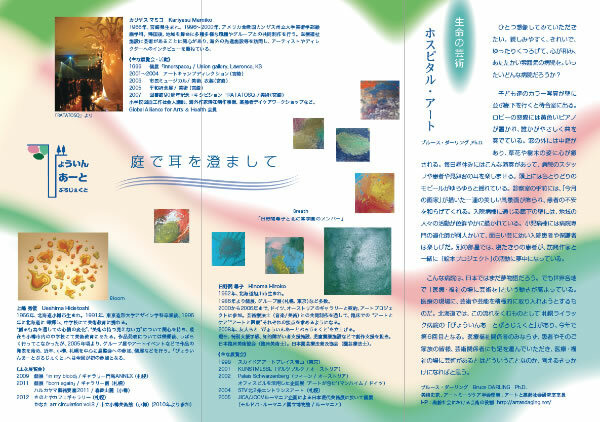 The "Hospital Art Project", primarily a project to exhibit the art work created by those who are disable or ill, began with the waiting room in Sapporo Lilac Hospital in the Fall season of 2008. Gentleness and warmth overflows from the creative works of art. With beauty and delicacy, such works are powerful enough to give hope and courage to those who view and reflect upon them. 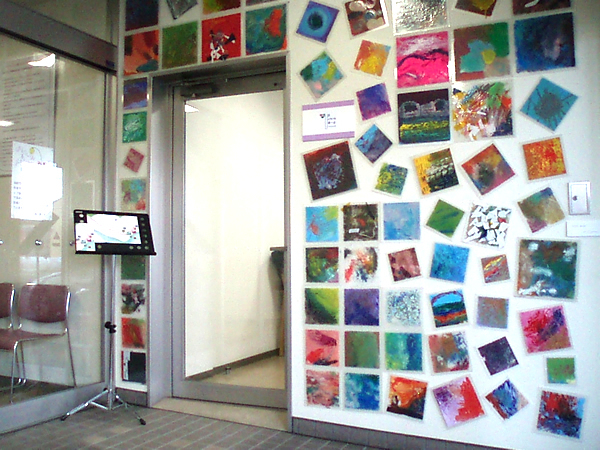 Art in a curative place such as a hospital setting, can be seen as "creative-life work", leading to the meaningfulness of life. A person's creative life work comes from one's life-reflection, therefore becoming an integral part of one's art work. It reaches out to others to gently release tension from stresses of life with its daily challenges. 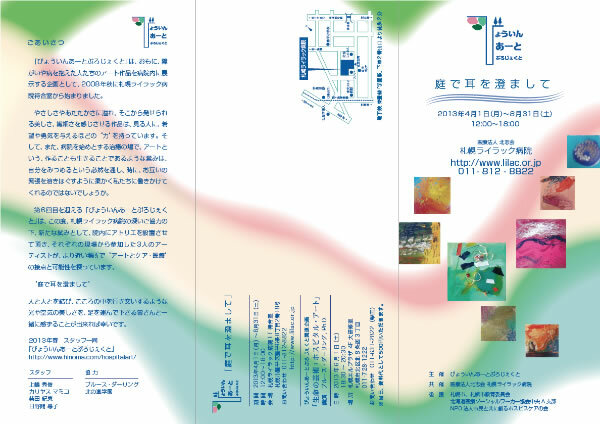 The "Hospital Art Project" holds its 6th exhibition this year. As a pilot project, an atelier is being created in the hospital. We certainly appreciate Lilac Hospital for this opportunity. As part of this pilot project, three artists will relocate to participate in the hospital's atelier. These artists will be able to explore new possibilities of the care-connection between "art" and "medical facility" from an atelier closer to those who are disable or ill.
"Listen Carefully in the Garden." We encourage you to visit our Garden, an experience of the beauty of light and air, for light and air connect our hearts. In this spirit of being connected, we thank you for your support. Lecture ; Bruce Darling, Ph. D.